Win $1,995 in design services! 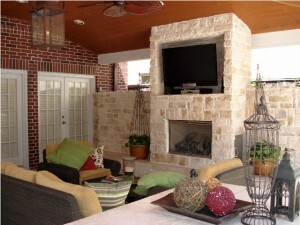 Outdoor living spaces vote contest: Win $1,995 in design services! Which of these outdoor living spaces of ours do you like better? Tell us and enter to win a $1,995 outdoor design package from Outdoor Homescapes of Houston! The contest runs until March 11 and is available for those in the Houston area who want new outdoor living spaces. One vote per person. Winning 2 to 1 so far is the bar/firepit area. This covered patio features an elegant roof extention matching the architecture of the house, a wet bar and several outdoor seating areas. Not to be outdone, however, the fireplace/TV room offers the opportunity to watch the football game in front of the fire in winter and movies by the pool in summer. Remember: This isn’t just for fun – Outdoor Homescapes of Houston swant to know what people are looking for in an outdoor living space! Then again – it’s totally fun. The design package goodies include two hours of in-home consultation, three hours of software drawings, including a plan and 3D graphics. So enter to win today! 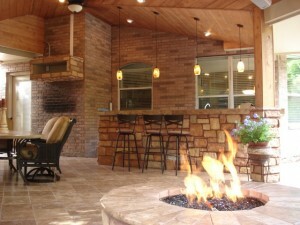 Or, if there’s another element of outdoor living spaces you feel is important, tell us about it in a comment! We love hearing from people!